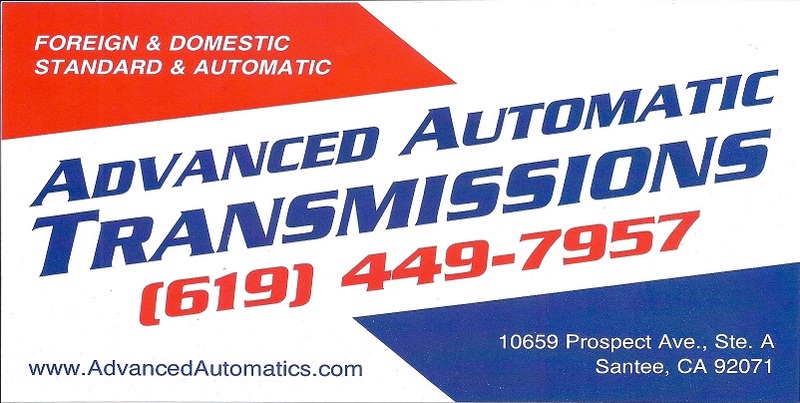 The Advanced Automatic Transmissions staff of transmission service & repair technicians and management realize that our auto repair customers are the most valued asset of our auto repair shop. We are always happy to receive testimonials from shop customers and equally happy to share their feedback with you! Thanks for fixing my car. I can"t thank you enough. Since you worked on it last time it has been perfect. My car was the 95 Chrys Cirrus LX. Ian , Just wanted to say thanks again for helping us get back on the road. Our little church is very excited that the youth are going to be able to use the van for our winter retreat. Thanks Again ! Chris Guess/ Youth Pastor. First Southern Baptist Church El Cajon. We are so happy with Advanced Automatic Transmissions. We had our transmission go out in our 2001 Rav 4 with irregularly shifting and the owner explained that it was a malfunctioning transmission computer. He rebuild our transmission and purchased a new computer from Toyota saving us a lot of money. He also advised us to pursue re-imbursement from Toyota. We did and they continually rejected our claim until Ian, the owner, personally wrote Toyota a letter explaining the issue and the reason for the damage to the transmission. We now received a check from Toyota reimbursed us for the entire amount of out of pocket cost including all parts and labor. Thank you for going out of your way to help us.